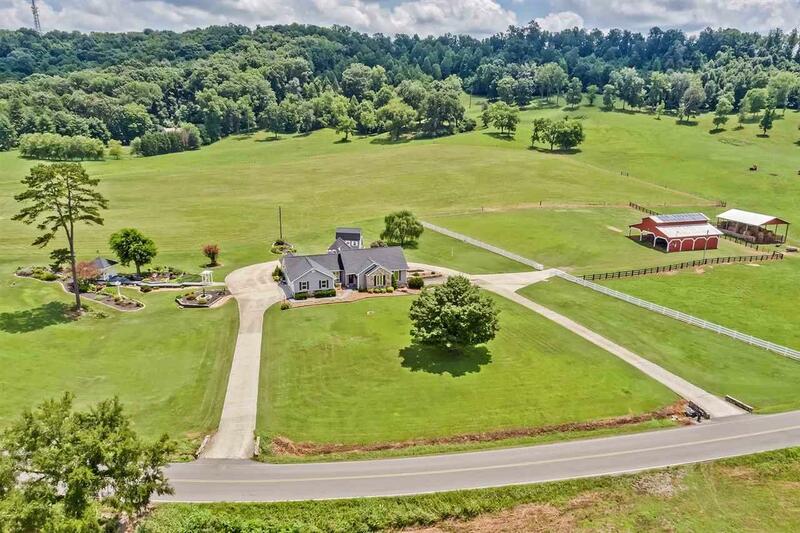 Over 48 acres of lush, green East Tennessee farmland accompanies this executive home. 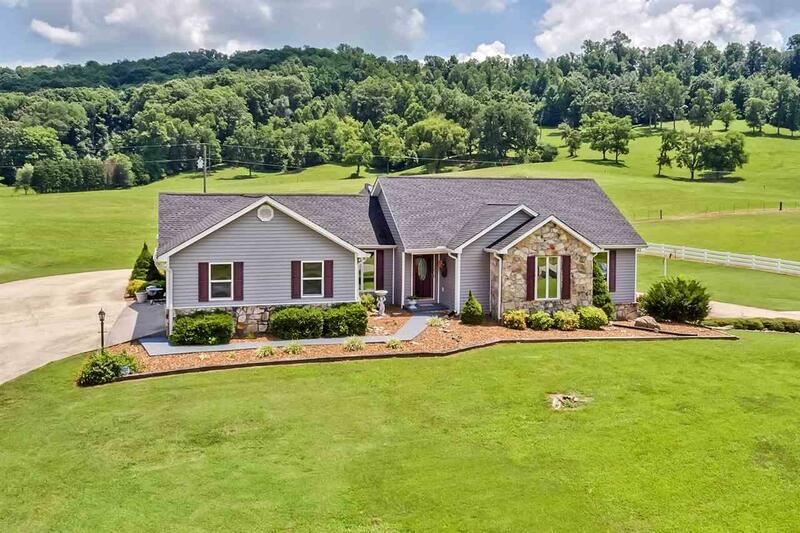 The spacious and well appointed home features a 515 sq ft master bedroom that has views of the pasture and barns. The master bath has a wall of custom cabinets and an expertly tiled shower. The kitchen features plentiful cabinets, a huge island, and a breakfast area tucked into a bay window for a 180 degree view of the farm. The kitchen flows into the formal dining area and from there you can enjoy an informal den with vaulted ceiling, custom cabinets and cozy gas log fireplace, or enjoy the more formal yet inviting living room with exposed beams and gas log fireplace. Downstairs you will find another entire living space: fully appointed kitchen, dining area, den, fireplace, full bath, and a huge bonus room that would be great for quilters, crafters, or home schoolers. Now! Let's step outside! The yard is incredibly well landscaped! There is a boardwalk to the gazebo that's surrounded by flower gardens and a fountain. A deck overlooks the drive that circles all the way around the home. A lovely patio can be home to your own hummingbird feeders, water fountains, and flowers. This is also a working farm! You can bring your own cattle, or just negotiate the ones that are already there! These cows are spoiled with two huge barns, a pond, a spring, pristine white vinyl fencing, and acre upon acre of plump sweet pasture. The 48X40 barn is topped with solar panels which provide enough income each month to cover the electric bill for the home. East Tennessee has so much to offer. 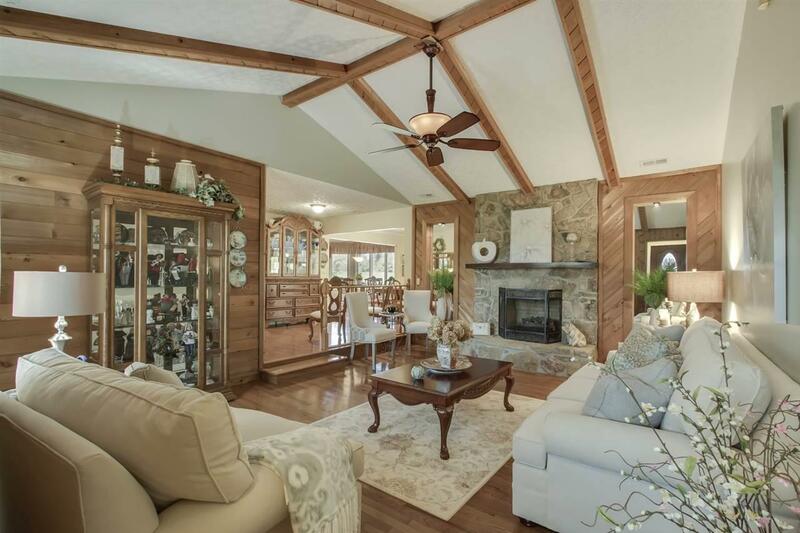 This home is only 3 minutes to I-75. Less than an hour to Chattanooga or Knoxville. Less than 2.5 hours to Nashville or Atlanta. Only a short drive to area lakes, rivers, mountains, state and national parks. 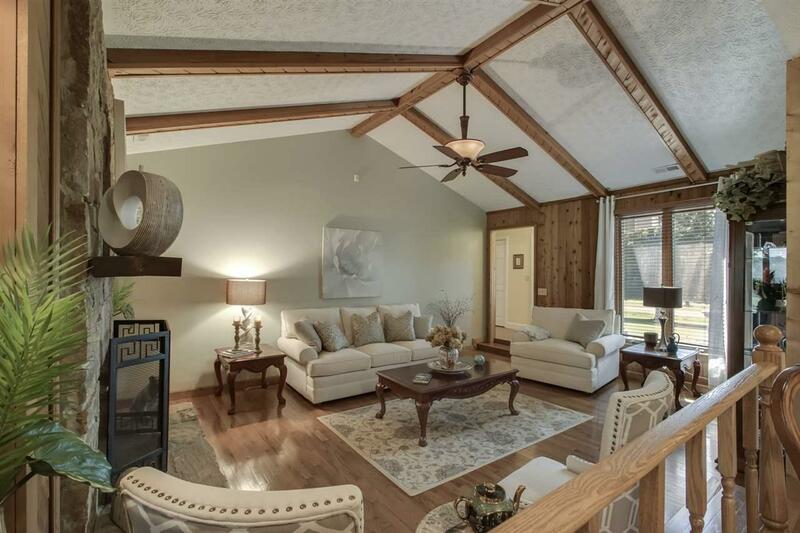 You owe it to yourself to schedule an appointment this picturesque property! Listing provided courtesy of Nancy Howard of Weichert Realtors - Sem Associ.